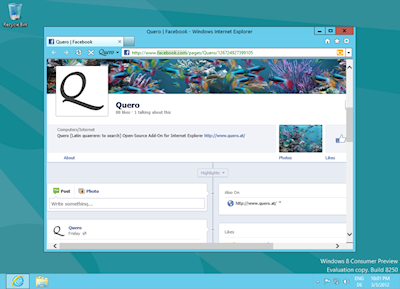 Windows 8 is heading towards a new direction and so does Quero. I have installed the Consumer Preview of Windows 8 and I am porting the Quero bar to the upcoming IE10 on the Desktop now. So IE10 on the Desktop will still support add-ons including Quero :) but in the long run Microsoft unfortunately plans to completely abandon add-ons from Internet Explorer, which is already the case in Metro IE :/ I appreciate IE's commitment to Web standards, but it is a pity that IE will not be as customizable any more, or will it? IE10 Metro is the new version that runs on the Metro interface and is primarly designed for tablets and touch input. IE10 Metro does not support any add-ons or plug-ins, meaning no Silverlight, no Flash, but also no toolbars and no browser add-ons. IE10 on the Desktop, however, is an upgraded version of IE9 and will still support plug-ins and add-ons, including Quero :) IE10 will also for the first time consolidate both 32 and 64-bit IE into a mixed 32/64 bit application (did not believe that this is possible, but it is ;) Unfortunately the Consumer Preview lacks the option from the Developer Preview to switch the IE tabs to 64-bit mode. Wondering, if this will come till RTM. While I love the 1980s-flavored Metro design (which I already know from Zune HD, WP7 and Xbox), I have concerns about the full-screen start menu for desktop mouse users and have to admit that I miss the visible start button and start menu. And what about Quero AdBlock IE10 TPL? IE10 continues to support Tracking Protection Lists and so the Quero AdBlock IE TPL is already compatible with IE10. Quero for Win 8 coming soon.